As we were trotting around the ring yesterday, our fabulous instructor Natalia said we were going to be doing some jumping (which she so charmingly calls “shumping,” a term we have now adopted). We laughed and thought she was joking…gulp, only she wasn’t. So the Offermann/Reeves clan spent Tuesday afternoon practicing the transition from posting into taking a jumping position and guiding our horses and ponies over a wee little fence while trotting! 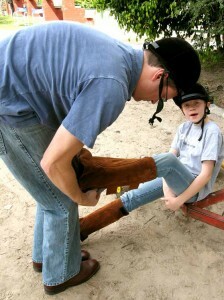 Pictured above, Tom is putting on Zoe’s polainas (“half chaps” or “short chaps”), each sporting their natty velvet helmet! This entry was posted on Wednesday, May 6th, 2009 at 9:44 am. You can follow any responses to this entry through the RSS 2.0 feed. You can leave a response, or trackback from your own site.